I don't have a gas hook up in my laundry room so I needed to find an electric dryer that accomplished three things: Is economical, fit the width of my space and has multiple dry cycle settings. The Whirlpool Super Capacity model fit my criteria nicely. It is only 29” in width so it fits quite well in smaller spaces. The features I like best are the 7 drying cycles and 4 temperature controls. There are wrinkle-free and permanent press and air fluff cycles too! The rotary dial controls are simple to use. Just set to your desired temperature and the clothes come out nice and dry every time. Loading and unloading is a breeze with front door hamper-style access. An added bonus is the interior light. I like this feature so I don’t have to turn on my room light to see if I missed a sock. The tumbler motor runs fairly quietly. The end of cycle signal lets you know when times up. The lint tray is top mounted and easy to clean. I recommend you clean after every cycle because his machine is very good at trapping the lint! 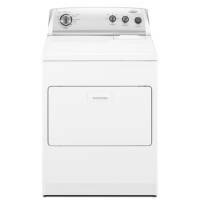 My budget was roughly $400 and I found this one on sale for $369 that was a great deal for a great dryer.